Five small hotels caught Interior Design 's eye. For mountainside viewing of the aurora borealis, head to the bar lounge at the Ion Luxury Adventure Hotel by Minarc—it's in Iceland! Teresa Sapey Estudio de Arquitectura channeled the surrealist spirit of Salvador Dali for the Room Mate Pau Hotel in Barcelona. And a hotel and spa in Monteigas, Portrual, references the oxidized sheet-steel faces of the region's traditional houses (Pedro Brigida Arquitectos painted the buildings at Casa das Penhas Douradas Design Hotel and Spa to match). Meanwhile, nautical stripes, ash built-ins, and distressed-oak floorboards scream on the beach on the Watergate Bay Hotel in the U.K., the work of Household. And don't forget Seifried & Mack's work on Hotel Scholl in Germany, which sports curvaceous furniture, exposed showers, and arresting artwork that's purely contemporary. 1. Firm: Seifried & Mack. Project: Hotel Scholl, Schwäbisch Hall, Germany. Standout: In a half- timbered house from the 15th century, curvaceous furniture, exposed showers, and arresting artwork are purely contemporary. Project: Watergate Bay Hotel, U.K.
Standout: Nautical stripes, ash built-ins, and distressed-oak floorboards all say on the beach. 3. Firm: Pedro Brígida Arquitectos. Project: Casa das Penhas Douradas Design Hotel and Spa, Manteigas, Portugal. Standout: Referencing the oxidized sheet-steel facades of the region’s traditional houses, these buildings were painted to match. 4. Firm: Teresa Sapey Estudio de Arquitectura. Project: Room Mate Pau Hotel, Barcelona, Spain. Standout: Channeling the surrealist spirit of Salvador Dalí, solid-surfacing was CnC-cut in forms both abstract and representational. 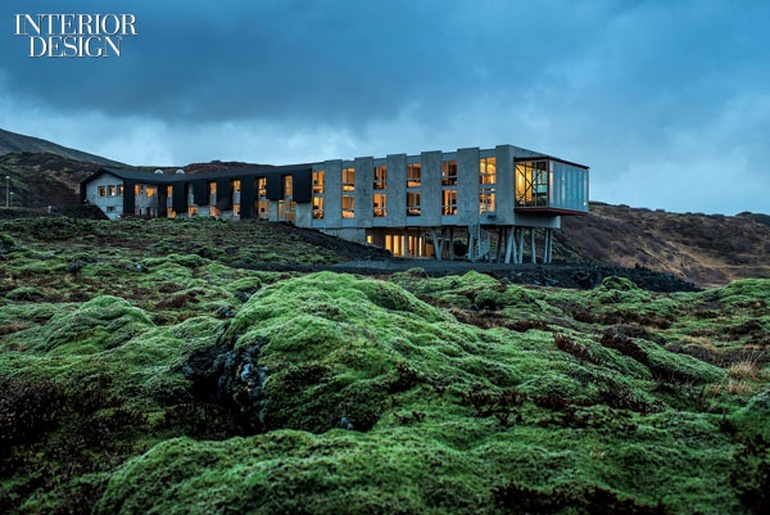 Project: Ion Luxury Adventure Hotel, Nesjavellir, Iceland. Standout: For mountainside viewing of the aurora borealis, a bar lounge in steel-framed glass houses custom walnut sofas.